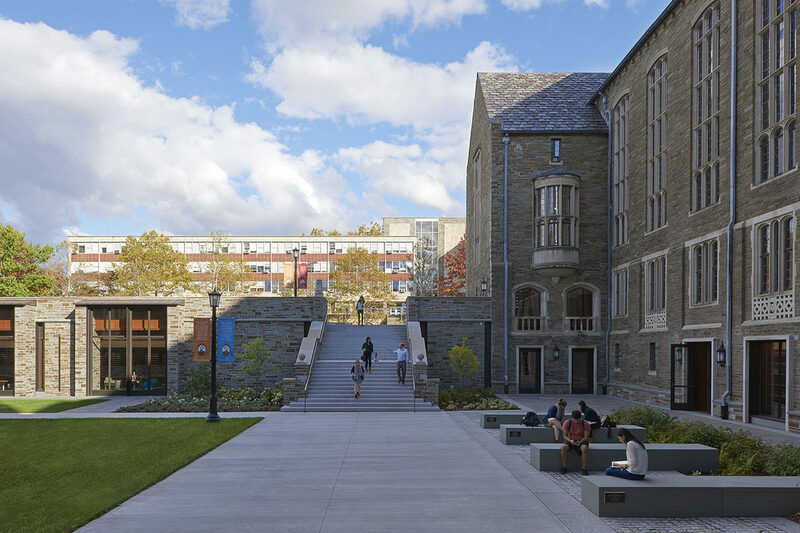 TWMLA is delighted that the Cornell Law School – Academic Center Addition has received an Excellence in Architecture Award for Building Additions, Renovation or Adaptive Reuse from the Society for College and University Planning (SCUP). TWMLA teamed with Ann Beha Architects for this project. Prior to the new addition, the Law School site included a formal central courtyard which did not align with interior floor levels. Because it was inaccessible from the buildings, the courtyard was rarely used. TWMLA’s site design lowered the courtyard to provide accessible indoor-outdoor connections and to activate the space. Seating, ADA access, and a set of grand stairs to the lawn provide the armatures necessary for people to comfortably inhabit the space.